What Can Companion Care do for Your Loved Ones? When you think of caregiving, what comes to mind first? While you may think of medical and personal assistance, caregiving does not always equate to nursing care. For many aging Americans or in-need adults, simply having a companion is all that’s required to maintain a comfortable level of independence. For moments like these, professional companion care can help. Rather than strictly medical assistance, this helpful service places a caregiver with your loved ones so they can enjoy life with a little extra help around the house or even out and about. Improved wellbeing: As adults age and retire, staying socially active becomes more difficult, often leading to diminished wellbeing and emotional health. Research has shown that seniors who maintain interpersonal interactions tend to have lower blood pressure and improved mental health. Having a companion can also help reduce the risk for cardiovascular problems, some cancers, osteoporosis, Alzheimer’s and rheumatoid arthritis. Greater medication adherence: More than half of American individuals 65-years-old and older regularly take at least five different prescriptions, yet 57 percent of those often forget to take their medication. This disconnect with medication adherence is costing the U.S. healthcare system billions of dollars and leading to unnecessary hospitalizations. With companion care services, caregivers are available to help seniors understand the importance of medication adherence and remind them to take their prescriptions as directed, and have them refilled as prescribed. Help inside and out: For many seniors, keeping their home clean, their laundry sorted and their pantry stocked can be difficult. Companion care aids those in need with many of the daily errands we often take for granted. Exercise and entertainment: Lacking the motivation to get up and get moving isn’t a senior-only trait – it’s something almost every American can relate to. With companion care, your loved ones will get the support they need to get up and be active, whether it’s a walk in the park or a friendly game of Scrabble. Caregiving is not always of a clinical nature. 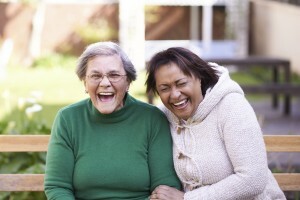 Companion care can create a culture of care and a personal connection to help your aging loved ones be happier and healthier. To find out more about what companion care can do for your family, contact your local FirstLight Home Care today.